Only 29 percent of the world surface is land. The rest is ocean, home to the marine lifeforms. This blog is about Life under the blue water (Sea). The Australian ghostshark, Callorhinchus milii, is a cartilaginous fish (Chondrichthyes) belonging to the subclass Holocephali (chimaera). Sharks, rays and skates are the other members of the cartilaginous fish group and are grouped under the subclass Elasmobranchii. 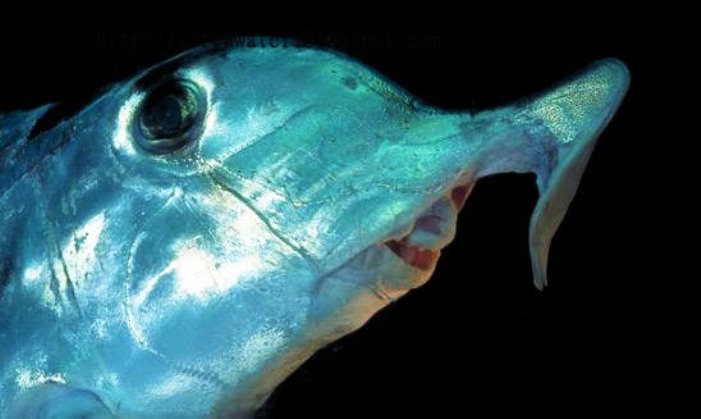 Alternative names include elephant shark, makorepe (in Māori), whitefish, plownose chimaera, or elephant fish. It is found off southern Australia, including Tasmania, and south of East Cape and Kaipara Harbour in New Zealand, at depths of 0 – 200 m.
The spotted handfish (Brachionichthys hirsutus) is a rare Australian fish from the family Brachionichthyidae. It is classified as Critically Endangered on the IUCN Red List 2002. It is a benthic fish usually found at depths of 5 to 10 m, with overall sightings varying from a minimum of 2 to a maximum of 30 m deep. 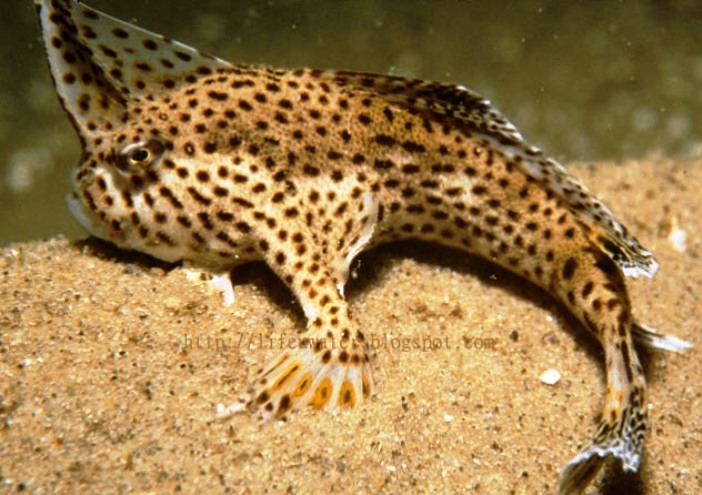 The spotted handfish is unusual in that it has highly adapted pectoral fins, which appear like hands (hence the name) and allow it to walk on the sea floor. It has a highly restricted range, being found only in the estuary of Derwent River, Tasmania, and nearby areas. 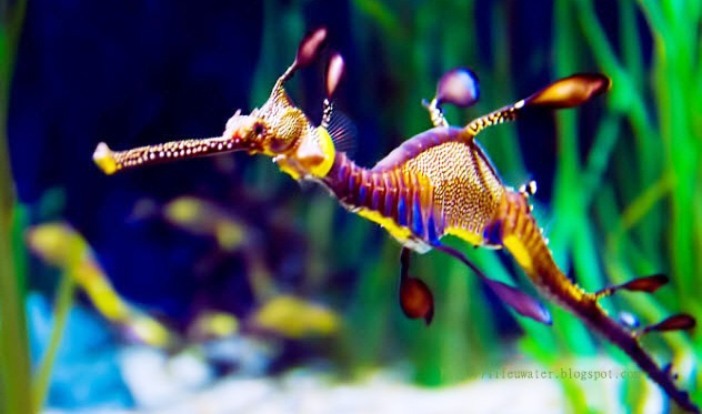 The Weedy sea dragon or common sea dragon, Phyllopteryx taeniolatus, is a marine fish related to the seahorse. It is the only member of the genus Phyllopteryx. It is found in water 3 to 50 m deep around the south coast of Australia, from Port Stephens, New South Wales to Geraldton, Western Australia. It also found in the waters around Tasmania. Weedy sea dragons are named for the weed-like growth on their bodies. This camouflage hides them as they move among the seaweed beds where they live. The weedy sea dragon is the aquatic emblem for the state of Victoria. The Spotted Sweetlips or Plectorhinchus chaetodonoides is a saltwater fish that actually changes colors over its lifetime. It is a denizen of coral reefs found at depths of from 1 to 30 m (3.3 to 98.4 ft). It can reach 72 cm (28 in) in TL. The heaviest known individual weighed 7 kg (15 lb). This species is of minor importance to local commercial fisheries and can be found in the aquarium trade. As you can see, when this fish is small its body is brown or tan and covered with white spots. 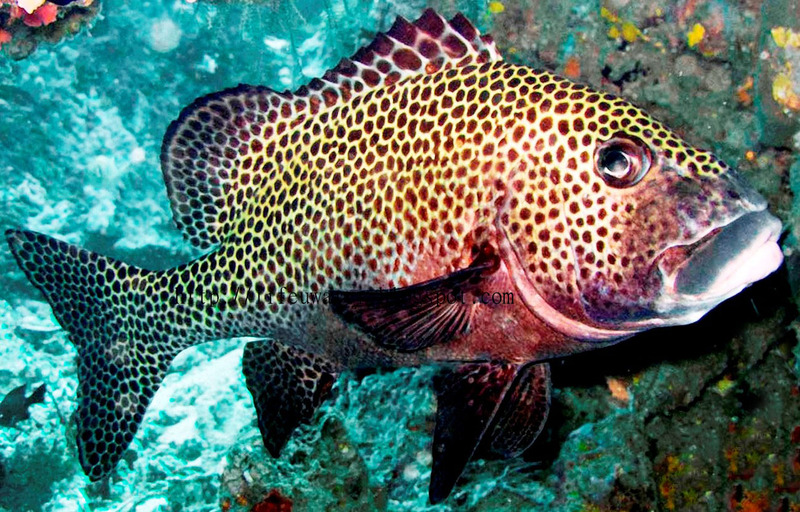 As the Spotted Sweetlips grows older its whole body turns white, and it develops black dots. Appropriate Home: In an aquarium with at least 15-gallons of water, an External Power Filter with a BIO-Wheel, 1/4-inch or less of gravel, and an Aquarium Heater adjusted to between 78 and 82 degrees F. Click here for more about warm water aquariums. Like most livebearers Swordtails will do better with 1 Tablespoon of Aquarium Salt per 5 gallons of water. Click here for more about Aquarium Salt. Recommended Diet: Floating flake food plus freeze dried blood worms, which are actually mosquito larvae. Both of these foods are sold in most stores that sell pet fish. Click here for more about feeding fish. I feed all livebearers a few Black Worms every other day. Click here for more about Black Worms. Compatibility: Like all livebearers Swordtails live best in a group with a few male Swordtails and several females. Swordtails are good tank mates for Mollies, Platies, Angels, Corydoras Catfish, Plecostomus, and Bigger Tetras such as Black Skirts, Red Serpaes, and Silver Tips. Click here to read more about several other groups of compatible fish. Blue - ringed octopus - the deadliest creatures under the blue ocean. Siamese fighting fish - incredibly beautiful, controversial and popular aquarium fish. Sundarban, the exceptional gift of God. (c) Mohi Uddin. Awesome Inc. theme. Powered by Blogger.